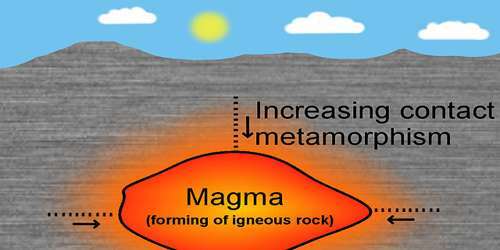 Igneous rocks are formed by the cooling and hardening of molten material called magma. 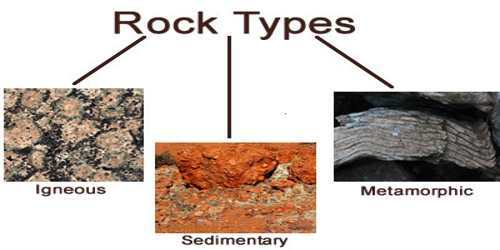 It is one of the three main rock types, the others being sedimentary and metamorphic. The word igneous comes from the Latin word ignis, meaning fire. Volcanic rocks are named after Vulcan, the Roman name for the god of fire. Intrusive rocks are also called “plutonic” rocks, named after Pluto, the Roman god of the underworld. The magma can be derived from partial melts of existing rocks in either a planet’s mantle or crust. Typically, the melting is caused by one or more of three processes: an increase in temperature, a decrease in pressure, or a change in composition. Generally, the longer the cooling time, the larger the mineral crystals can grow. Trapped deep in the Earth, magma is allowed to cool slowly. Examples of intrusive rocks are granite and gabbro. Granite is made up of three common minerals – quartz, mica and feldspar – and when viewed from a distance appears tan, pinkish or gray, depending on the concentrations and grain sizes of the three minerals. This rock is very widely used as a building material, due to its abundance and strength. Gabbro has lower quartz content than granite, and is therefore much darker. Igneous and metamorphic rocks make up 90–95% of the top 16 km of the Earth’s crust by volume. Igneous rocks form about 15% of the Earth’s current land surface. Most of the Earth’s oceanic crust is made of igneous rock. 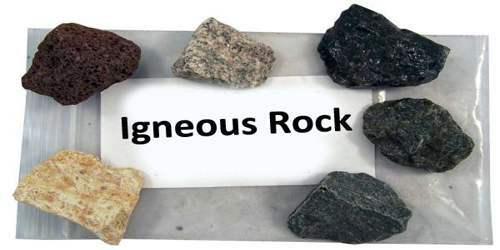 Igneous rocks are classified according to their texture and mineral or chemical content. The texture of the rock is determined by the rate of cooling. The slower the cooling, the larger the crystal. Intrusive rock can take one million years or more to cool. Fast cooling results in smaller, often microscopic, grains. 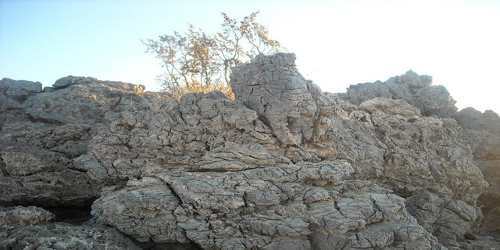 Some extrusive rocks solidify in the air, before they hit the ground. Sometimes the rock mass starts to cool slowly, forming larger crystals, and then finishes cooling rapidly, resulting in rocks that have crystals surrounded by a fine, grainy rock mass. This is known as a porphyritic texture. Igneous rocks are formed from the solidification of magma, which is a hot (600 to 1,300 °C, or 1,100 to 2,400 °F) molten or partially molten rock material. The Earth is composed predominantly of a large mass of igneous rock with a very thin veneer of weathered material namely, sedimentary rock. Over 99% of Earth’s crust consists of only eight elements (oxygen, silicon, aluminum, iron, calcium, sodium, potassium, and magnesium). Most igneous rocks contain two or more minerals, which is why some rocks have more than one color. Molten materials are found below the earth crust and are normally subjected to extreme pressure and temperatures – up to 1200° Celsius. Because of the high temperatures and pressure changes, the molten materials sometimes shoot up to the surface in the form of volcanic eruption and they cool down to form volcanic or extrusive igneous rocks. Some of the molten materials may cool underneath the earth surface very slowly to form plutonic or intrusive igneous rocks. It is because of the extreme heat levels and changes in pressure that igneous rocks do not contain organic matter or fossils. The molten minerals interlock and crystallize as the melt cools and form solid materials. Igneous rocks contain mostly silicate minerals and are sometimes classified according to their silica content. Silica (SiO2) is a white or colorless mineral compound. Rocks containing a high amount of silica, usually more than 50%, are considered acidic (sometimes the term felsic is used), and those with a low amount of silica are considered basic (or mafic). Acidic rocks are light in color and basic rocks are dark in color.